Yep, if you didn't know, denim is my thing. 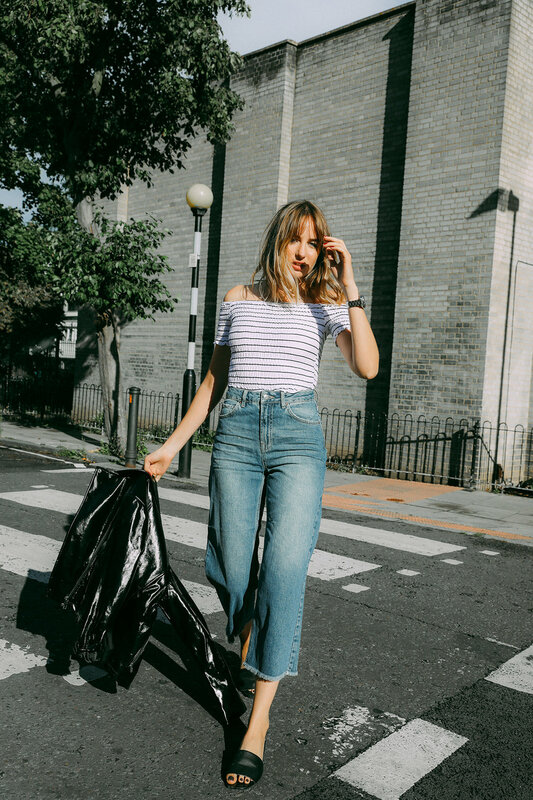 So when Topshop asked me to shoot some looks with their new denim styles for their newsletter I said YES PLEASEEE to that, and I loved the photos so much I thought I would share them on my blog too. So I've got two looks here that I styled up around two pairs of stand out denim. First up are these insane wide leg ones. Now, one thing I will say is to bare in mind my height and leg length. I am around 5"8 and 32" leg, and these just sit on the very top of my foot. 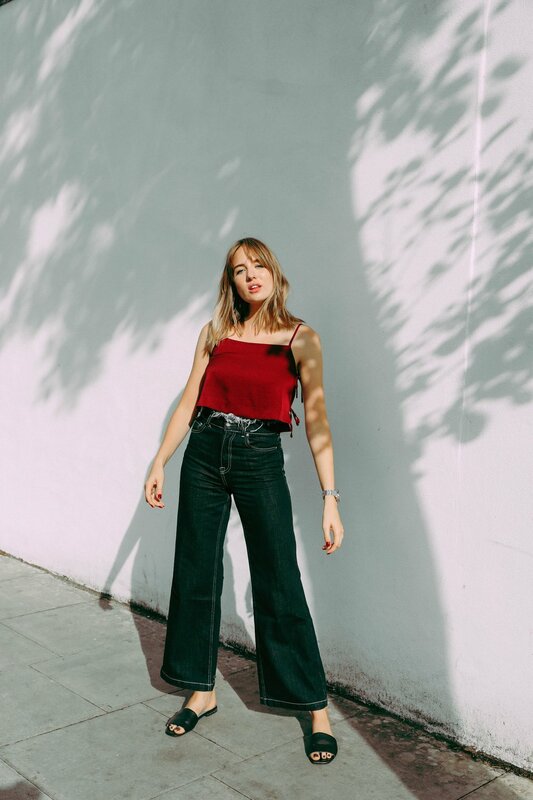 There is nothing to say you can't cut the hems off if you are smaller and like this length, because of the frayed waistband it would work really well- and we all love a frayed hem too. The waistband really is the winning feature. I teamed them with this crop cami which sat at just the right length - but of course it would work just as well with a t-shirt tucked in. I have a vision of these with my Jil Sander heeled boots that I wore endlessly last winter, and a black turtleneck for a killer evening look in the Winter. But for now the slides and a skimpy top make the perfect combination too. Second up we have a more classic pair that are definitely a little more wearable. They still have some really amazing detailing on them, mainly the huge seam on the inside of the leg which makes them a wide leg fit. 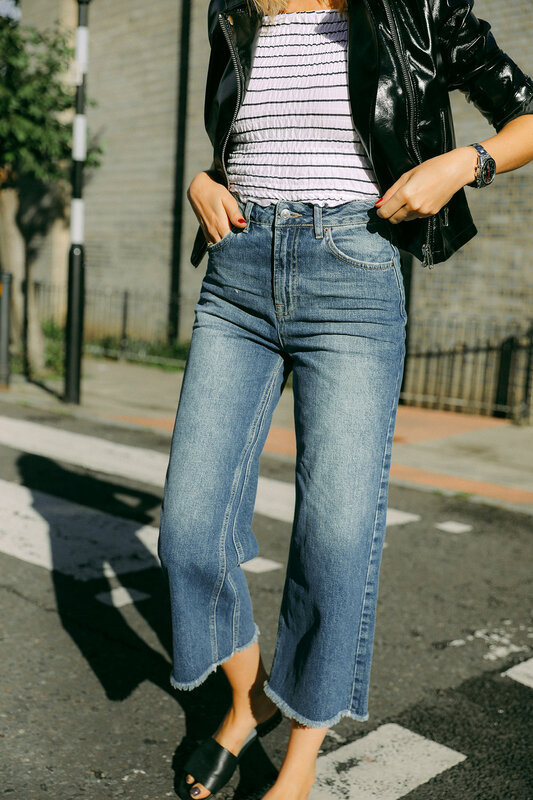 I always love wide leg jeans because I find they slim out my waist a lot, and this pair are no exception for that. Hence going for such a tight fitting top - this is super stretchy and when I unpacked it I thought there was not a chance in hell I would get myself into it, but it really does stretch out! Because it's so tight it means you can easily wear a jacket over it despite it being off the shoulder. I have some off the shoulder tops than I can't wear a jacket over because you get so bunched up under the armpits, but that doesn't happen with this one at all! This vinyl jacket has been something I have been struggling to style since this, despite how much I love it. I love vinyl jackets and trousers on other people, but it's something I have never really mastered myself. I am thinking I might give it a go with an all black outfit and play around with textures a little bit. Watch this space for that one, I am determined to crack styling vinyl! Both styles of denim fit true to size!